Treat yourself to an in-home spa experience with this skin rejuvenating face mask. 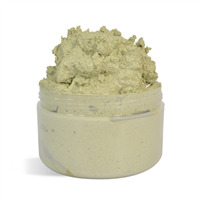 White kaolin clay, aloe vera powder and rhassoul clay combine to make this soothing and relaxing product. 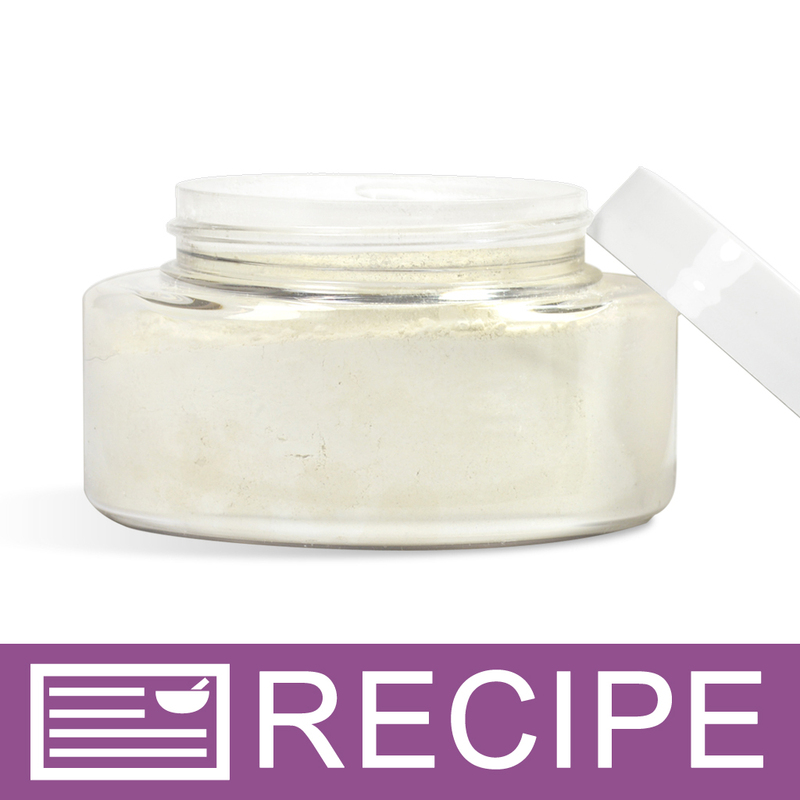 To use scoop 1-2 scoops of the powdered mask into a bowl, and add just enough water to make a paste. Spread the paste onto your face, and sit back and relax as it hardens and dries. Wash off with warm water to reveal your rejuvenated skin! You Save $48.45 by purchasing this kit rather than buying the items separately. "Love the kit, except for one flaw"
COMMENTS: I purchased this kit while it was either on sale, or maybe because it was on my Wish List for so long. I have had mixed reviews from customers on this, but one mention is constant. The ones that love the product are discouraged by the scoop in the container. The ones that are so-so, say the same. I don't remember the instructions, but the kit comes with a scoop for each container, or at least mine did. When you include this in the jar, the product can shift to make room, but the actual scoop hinders proper closure on the jar. I have tried every which way imaginable to fix this issue, and my only solution is shrink wrap. However, I have to use it from top to bottom, rather than just the lid itself. This still has allowed for some product to shake out, prompting further comments from customers, especially those that are giving it as a gift. The overall product is awesome, the packaging could use some work. COMMENTS: This kit could not have been any easier to make. I love how it turned out...so professional. I tied raffia around the jar and added the scoop. I tried one for myself and just fell in love with it. My skin felt great after using this. I can hardly wait to get it to my customers. COMMENTS: Love this mask. My customers keep coming back for this soothing one. Thanks WSP! COMMENTS: Cooling and refreshing my customers loved it! Will purchase again. COMMENTS: I used this when I first started making bath and body products... it was one of my jumping off points. It is a great kit for beginners and using it gives ideas for other masks. My customers love these and the other masks that were inspired by this kit. Thanks! COMMENTS: This mask is great! As it dries on your face you can really feel it tighten. When it's rinsed off it just melts off your skin. The aloe Vera in this is great. This is a customer favorite for my facial products. I love that WSP offers kits because you get everything you need. The cucumber fragrance is a great pair with masks. "can i add aloe gel to this and make it a gel face mask and if so do i need a preservative ? " Staff Answer You can add aloe gel to make this a face mask. Since the gel already has a preservative, you do not need to add an additional one. "Is it supposed to make your face red? I feel like a burning sensation as I let it dry. Did I do something wrong? " Staff Answer It sounds like you may have had an allergic reaction to something in the face mask. It should not burn or make your face red. If you feel this, it should be washed off immediately. 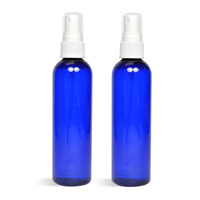 "Can you use an essential oil or a hydrosol instead of the fragrance oil?" Staff Answer Yes you can. If using an essential oil, you would use 1/3 of the amount we used for the fragrance oil. We recommend testing the hydrosol since it is a water-based product to make sure it is not too wet for the dry mask. "Can i enterchange containers bought with this kit and adjust overall price?" Staff Answer Hi Vanessa, I'm sorry but we cannot swap items in a kit. They are sold as-is. You can purchase all ingredients separately if you prefer. "Is packaging this mask dry the best method, or is there a way to go ahead and mix with water then package and maybe add a safe preservative like the O Plus?" Staff Answer We do recommend packaging this mask dry. If you do want to add water and preservative, you would want to be sure to test this for any molding, etc. I usually like to package my masks dry, as there is less chance of spoilage. You can include in the instructions to only mix what is needed for each use. "I am going to make this recipe- but instead of using the jars- I'm going to get zip up pouches. 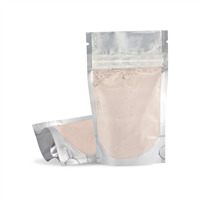 I'll end up buying the ingredients separately but im wondering that since their is 16 oz of koalin clay, 2 oz of aloe vera powder- would that mean I have a total of 18 oz and can make 18, 1 oz pouches. I dont want to order the wrong amount of pouches. Any thoughts- thanks in advance! What do many prefer- bags or jars?" Staff Answer This kit fills (14) 4oz jars therefore the volume of the total batch is closer to 49oz (3.5oz x 14) Therefore I would estimate you could get roughly 40-50 1oz bags. "How many applications can you get out of one jar?" Staff Answer You should get about 4 applications out of his recipe. Depending on the customers usage. "Can I add cosmetic grade powder colorant to this face mask, for example to make it pink?" You can, just make sure the dye you use says skin-safe of course. Also the dyes usually say under the info if they will stain skin or not. No matter what, always use as little as possible. I usually do a spot test on myself after ive mixed the cream for about 2 minutes. I hope that helps, good luck!